On orders from Hitler, in July 1942 production capacity of the Panzer 38(t) was switched to self-propelled gun chassis. This prompted a new design in which the engine was moved to the centre of the vehicle, which allowed the gun to be moved to the rear. In addition, frontal armour was reduced, which also lessened overall weight. The vehicle mounted the the potent 75mm Pak 40/3 gun, and at the beginning of February 1943 Hitler was informed that production would reach 150 units per month (though this level was not reached until November of that year). In May 1944, production of the Marder III was terminated in favour of the Jagdpanzer Hetzer. By that time a total of 975 vehicles had been produced for the army. Those Marders built during 1943 had a rounded, cast cover for the driving compartment at the front right-hand side of the vehicle. At the end of 1943, a simpler welded cover was introduced, with the front towing tugs formed from extensions of the side armour plate. 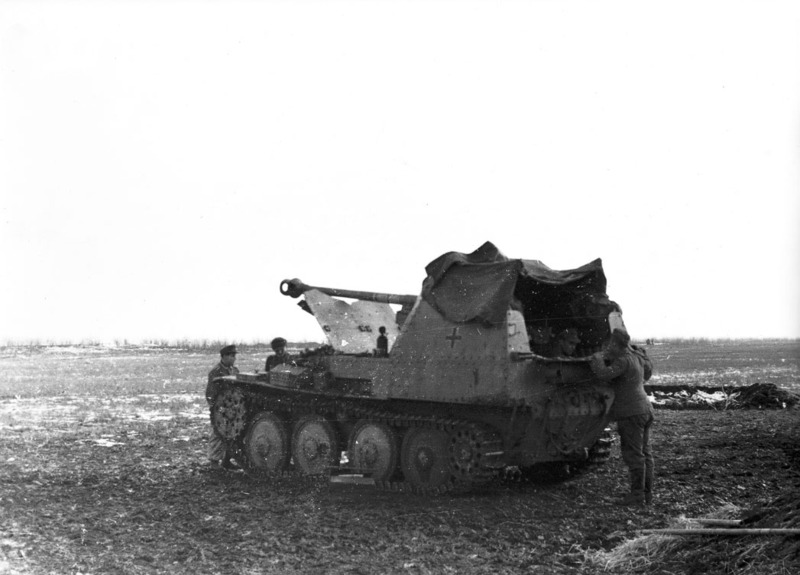 The Marder III was deployed to the antitank detachments of both panzer and infantry divisions from May 1943. They served on all fronts during the war, especially on the Eastern Front, and at the end of the war there were still over 300 in Wehrmacht service.